Our bodies are essentially made up of vibrating fields of energy, generating a vast symphony of vibration that creates matter. Everything vibrates at a certain resonance. When we tap into the resonance of who we want to be, miracles can happen. Managing our busy lives which are full of distractions, and operating in a harmonious state can be challenging. This is the reason meditation has become such a popular part of our modern culture. The benefits of meditation are manifold, including an increased ability to focus with clarity, a calm and pleasant demeanor, and self-mastery in many fields. Scientific evidence has clearly proven the benefits of meditation on the mind and body. The brain activity of skilled meditators have been studied via EEG (electroencephalograph), which measures brain activity as tiny electric pulses on a monitor. Repeatedly studies have proven that the brain is more harmonious while in a meditative state, and ideal attributes such as calmness and heightened awareness are clearly indicated. These ideal states are reflected as certain brainwave frequencies. Each frequency relates to a specific level of consciousness from deep sleep to wakefulness, and reflects our potential for creativity, intuition, clarity, relaxation, and focus. 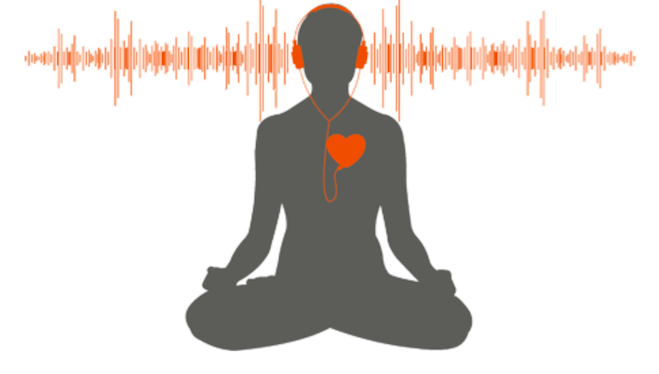 If you are having trouble meditating, as most people do, there is a way to enter the meditative state through sound. This is called Brainwave Entrainment. Brainwave entrainment can be achieved through listening to certain tones that affect correlatation to that frequency in the brain. 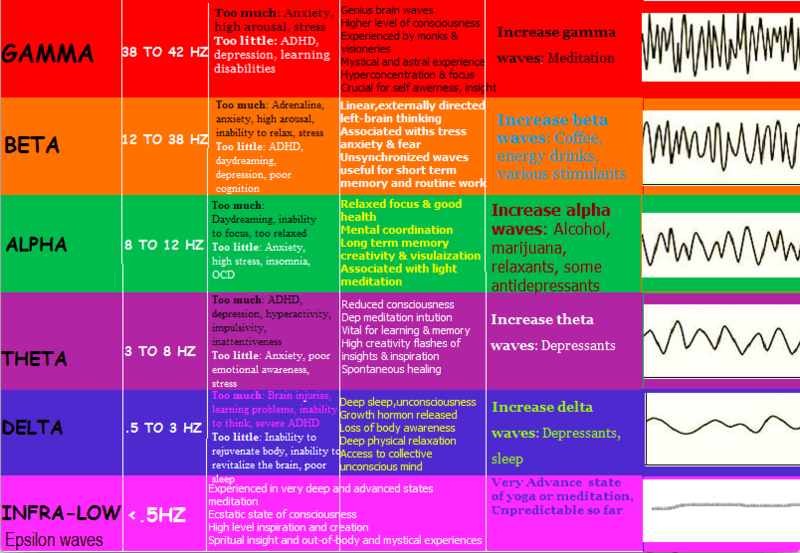 There are seven brain wave frequency ranges, each reflecting a certain state of wakefulness and mind activity. Effective meditators predominantly register in the theta, alpha, or gamma range. * Please keep in mind, there is often variance in research as to the exact frequency range of each state. As the mind transitions from one state to another, there is integration between the two states, it is not an abrupt change. Therefore some variance in the frequency of each range is present. Following is an outline of the benefits and drawbacks of each brainwave frequency. Afterwards, we will review different techniques available to achieve brainwave entrainment. These hard to discern brainwaves are often present in the most advanced yogis, who can slow their heart rate to a point where it is undetectable. Close to a nonphysical state, those who monitor such slow brainwaves indicate feelings of euphoria, and sometimes have an out-of-body experience. BALANCE: Ecstatic states of consciousness, suspended animation, spiritual insight. When the body is resting in a deep dreamless sleep, it is in a Delta state. Here the natural powers of recuperation occur. The intuitive mind is able to do its work, and healing takes place. Many people who engage in healing or therapeutic work display these brainwave states even while awake. Delta waves are most prominent in infants and children in the awakened state. BALANCE: Restorative and healing, deep relaxation, deep sleep, rejuvenation. IMBALANCE: Lack of conscious awareness, learning disabilities, disconnected from the outer world. Theta is a semi-hypnotic state indicated when the mind is deeply meditating, or in dream sleep (REM). Intuitive and receptive, the focus is inward. The subconscious is accessed in this state, allowing for deeper insight and resolution of problems that are rooted in the hard to reach subconscious. Creativity is also present, along with the feeling of spiritual connection. BALANCE: Intuitive, relaxed, spiritual, emotionally connected, creative and insightful, mystical, access to the subconscious. Alpha is the bridge between the conscious and the subconscious mind. Here you are aware of both the inner and outer worlds. An awakened state, Alpha indicates a relaxed and calm mind. Imaginative play is engaged, including daydreaming and creative visualization. Creative insight and acceptance allow for peak performance in many areas. The calm focus while in an Alpha state is often present in musicians, great athletes, and artists. BALANCE: Calm and relaxed, non-linear thinking, creativity, imagination, bridges the subconscious and conscious realms, enhanced perception and intuition. IMBALANCE: Lack of focus and attention, inability to take action, lack of time sensitivity. This is the “normal” waking state of most humans who are actively engaged. When the mind is discerning and analytical, beta brainwaves are prominent. The mind is able to focus in and concentrate on the task at hand. The higher Beta frequencies reflect fear, anxiety, being stressed-out and feelings of restlessness and nervousness. BALANCE: Linear thinking, socializing, stimulating, reading and writing, logical analysis, focus and attention. IMBALANCE: Insomnia, stress, anxiety, hyper-critical, paranoid. These brainwaves are harder to detect visually as their amplitude is low on the graph. In the Gamma state you begin to synthesize data and enter a realm of higher understanding with bursts of great insight. These brainwaves sweep across the brain, creating the big picture out of your fragmented thoughts. Elevated concentration is present, with the ability to ascend into the mystical and transcendental realms. These waves are prevalent in Tibetan monks. BALANCE: Integration, emotional stability, energy, lovingkindness, happiness and confidence, higher awareness, enhanced learning and greater retention. IMBALANCE: High state of arousal, restlessness, lack of sleep, hallucinations, schizophrenia. At the highest end of the spectrum, lambda brainwaves begin to move one beyond matter and into altered states of consciousness. They have Epsilon brainwaves embedded in them, and vice versa, indicating a circular relationship between the highest and lowest brain frequencies. Epsilon and Lambda seem to be entry and exit points into the circle of human consciousness. IMBALANCE: Unusual state of consciousness that is lacking in research. Normal human brainwave states are calculated between 0.5 and 30 hertz, anything above or below that is considered extraordinary. Epsilon and HyperGamma or Lambda brainwaves are extreme states of consciousness at the beginning and end of the spectrum. They are rarely present in normal waking humans, and are difficult to detect on an EEG. While brainwaves were first monitored in the 1920s, research regarding Epsilon, Gamma, and Lambda brainwaves began in earnest in the 1980s and 1990s, and there is still a lot to learn about the brain in these states, and what they indicate. Epsilon and Lambda waves have been found in subjects who are in extreme states of meditation. They are connected with a feeling of complete bliss and compassion. Those who indicate Epsilon and Lambda brainwave states often describe euphoric experiences with great spiritual and personal insight, as well as spontaneous out-of-body experiences. It will be interesting to further explore these realms of consciousness, and their positive and negative effects. There are several means of receiving brainwave entrainment through sound, these include Binaural Beats, Monaural Beats, and Isochronic Tones. All three are found to be effective, but each has a slight variance in their appeal to the listener, and in their mode of delivery. Binaural Beats occur when the brain synchronizes two different sounds delivered through headphones. What actually happens is that the brain processes one frequency delivered to the right ear, and a different frequency delivered to the left ear, then generates a brainwave that is equal to the difference between the two sounds. This auditory response occurs in the brain itself. So for example: If you put on headphones and in your right ear is a tone that generates a sound of 114 hertz (hertz is the rate of sound measured in cycles per second), and in your left ear is a tone operating at 124 hertz, your brain will then create a tone that is equal to the difference between the two, which in this case is 10 hertz. According to Gerald Oster in his legendary paper on binaural beats in Scientific American in 1973 “Auditory Beats In The Brain”, Binaural Beats are an effective tool for brainwave entrainment. He also states that some people are not able to hear Binaural Beats. The optimal range to deliver Binauaral Beats is around 440 hertz, after that they can be hard to discern, and disappear altogether at around 1000 hertz. Both men and women lose the ability to hear Binaural Beats above 1000 hertz, but he found women lose the ability to hear them in the lower ranges as well, which may be linked to estrogen levels in the body. 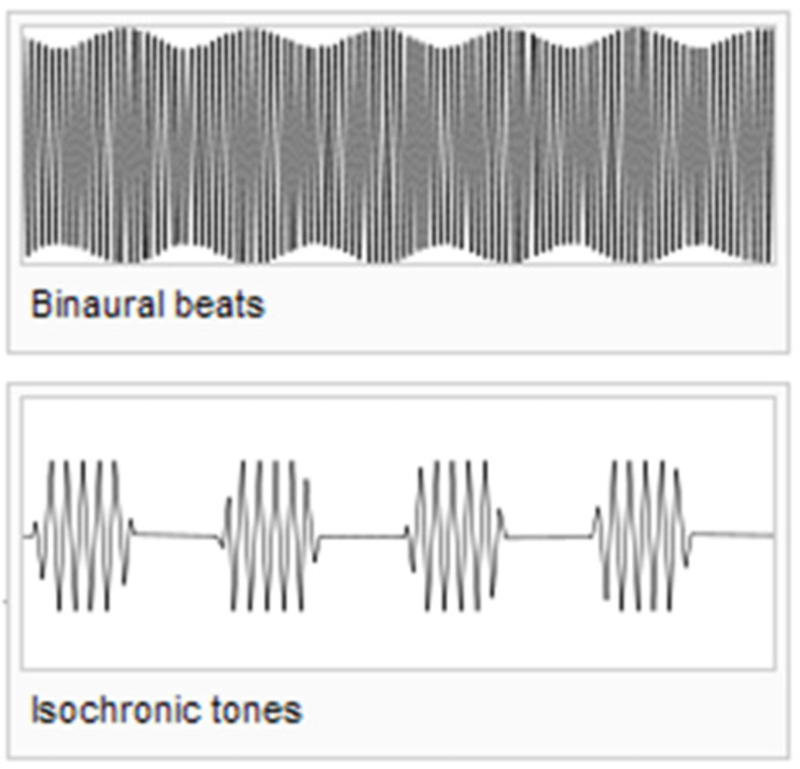 Unlike Binaural Beats, Isochronic Tones are generated from a single tone, not two. These tones are created by a sound engineer, therefore headphones are not needed for the entrainment effect. The pattern of the tone is more distinguished than Monaural and Binaural Beats because of the quick intermittent pauses in sound. Each wave in the frequency has a distinct beginning and end point. The sound created by an Isochronic Tone is very prominent, which may be irritating to some, but engaging to others. They are found to be an effective tool for brainwave entrainment. You may prefer to listen to Isochronic Tones accompanied by background music, making them more pleasant to listen to. A study by Doherty Cormac in 2014 determined that the entrainment effect was just as effective using Isochronic Tones with music, as without. Monaural Beats are created by a sound engineer. They do not require headphones, so they can be advantageous in settings where headphones are not ideal to use. Essentially Monaural Beats can be heard in a single ear like Isochronic Tones, whereas Binaural Beats require two ears, each ear receiving different frequencies to create a third frequency in the brain. Monaural Beats and Binaural Beats appear to be processed in different parts of the brain. The beats are similar in sound, but perception and preference for sound can vary greatly depending on each individual. Research done by David Seiver from Comptronic states that Monaural and Isochronic Tones may produce a stronger brainwave entrainment effect than Binaural Beats. The large majority of the research however has been based on the effectiveness of Binaural Beats. Trying out different techniques and sound track compositions will help you to determine your preference, and which tool is most effective for you. All three modes are found to be effective. Essentially the best approach is the one that works best for you. There have been numerous scientific studies on brainwave entrainment over the years, from extensive research on Binaural Beats in the 1970s to more recent studies on the effects of Monaural and Isochronic Tones. The tracking of brainwaves began in 1924 with the creation of the electroencephalogram, or EEG, by German psychiatrist Hans Berger. Berger was looking for proof of psychic energy in the brain. By the 1970s research on brainwave entrainment began in earnest with significant contributions made by Gerald Oster and Robert Monroe, using the EEG to display its effectiveness. According to Dr. Gerald Oster of Mt. 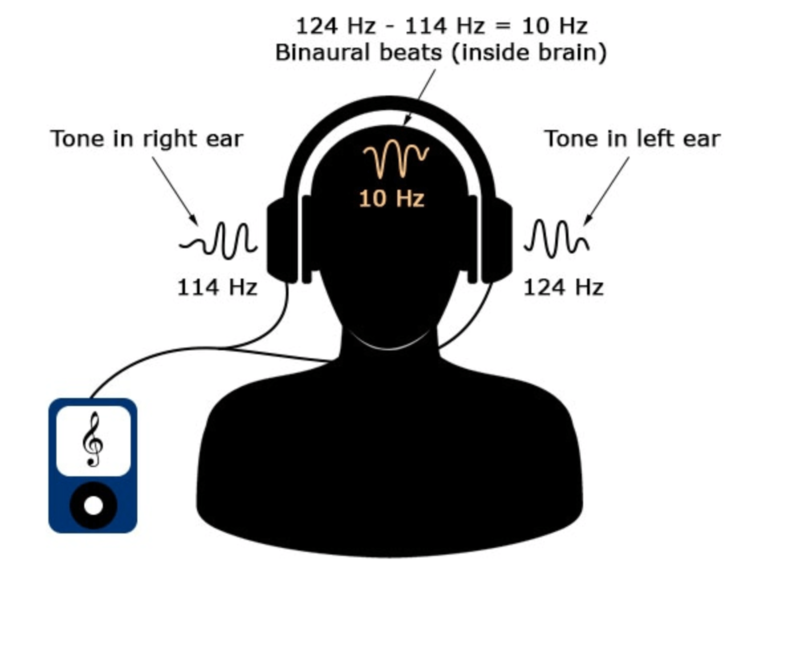 Sinai Medical Center, Binaural Beats are created in the brain using two slightly different tones in each ear, forming a brainwave pattern that is equal to the difference between the two tones. Using this method, the brain can be stimulated to achieve certain states of consciousness that provide optimal functioning of the brain. Around this time Robert Monroe was also investigating brainwave entrainment. A radio and television expert, his studies on audio and video influences on the mind eventually led him to have an out-of-body experience through sound. Monroe became fascinated with the ability to control his state of consciousness through audio-guidance technology. He created audio tapes called Hemi-Sync to generate hemispheric synchronization in the brain, as evidenced on an EEG. This led to the creation of The Monroe Institute in 1974, where Monroe was joined by a group of fellow researchers in using his Hemi-Sync techniques for brainwave entrainment, allowing the listener to achieve beneficial results. The Monroe Institute provides seminars teaching others how to use audio therapy to improve concentration, meditation, reduce pain, and enhance their overall mental, physical, and emotional well-being. 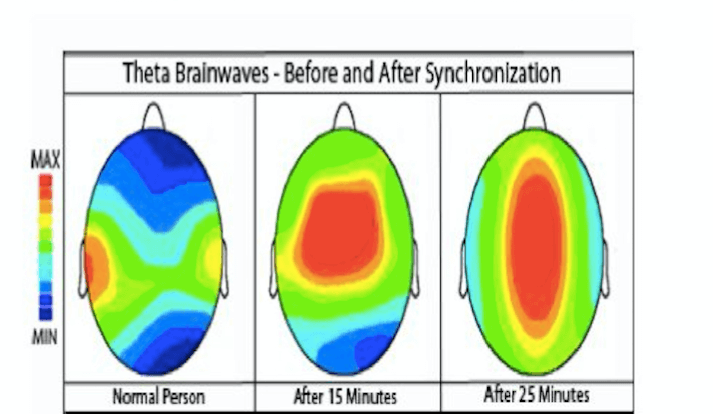 According to Michael Hutchison in his book Megabrain Power, peak mental states found in meditators, athletes, and artists can be replicated by brainwave entrainment, which can produce positive neurochemical compositions in the brain, such as improved levels of DHEA and melatonin, and create hemispheric symmetry. Dr. Robert Cosgrove Jr., a professional in the biomedical and pharmaceutical industries, found that brainwave stimulation can be an excellent neuro-pathway exerciser, providing the potential for improvements in cerebral performance. The list of researchers who advocate brainwave entrainment through sound is quite impressive and includes: Jim Lagopoulos of Sydney University, Australia, Dr. Suzanne Evans Morris, Ph.D., Dr. Lester Fehmi, Director of the Princeton Behavioral Medicine and Biofeedback Clinic, Dr. Arthur Hastings, Ph.D., Dr. Joe Kaniya, Director of the Psychophysiology of Consciousness Laboratory, Dr. Bill D. Schul, Dr. Jeffrey D. Thompson, and Drs. Tina L. Huang and Christine Sheraton, among many others. These doctors and researchers found that even a single session of brainwave entrainment could have therapeutic effects. 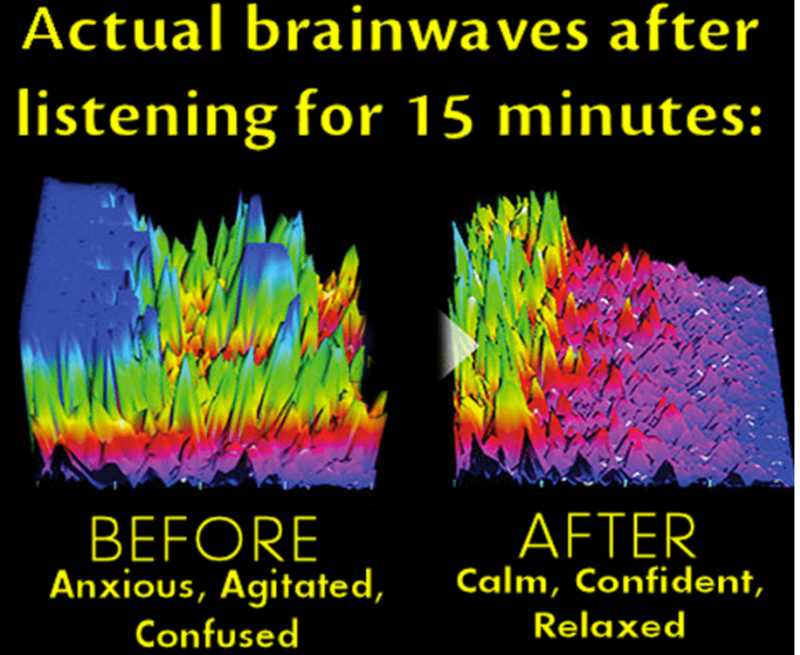 Brainwave entrainment can even assist in treating alcohol and drug addiction. In one study, two groups of alcoholics were sent through different treatment patterns as an experiment. One group went through the 12-step program provided by Alcoholics Anonymous. The other group simply received fifteen 20-minute sessions of Alpha-Beta Binaural Beat treatment sessions. The AA group who received the 12-step program relapsed after 13 months at a rate of 80%, with no change in levels of depression. The Binaural Beat group had a significant decrease in relapsing at a rate of only 20%, with a 30% decrease in incidents of depression. While brainwave entrainment is just beginning to grow in popularity, The Monroe Institute was the first formal full-fledged school to teach these techniques, founded by Robert Monroe in 1974. Since then, other business and education models have been developed such as Mindvalley OmHarmonics, a popular meditation and brainwave entrainment company founded by Vishen Lakhiani, a magnetic public speaker and passionate entrepreneur who practices new and innovative business models. Now we are seeing an expansion in the number of companies offering brainwave entrainment recordings to benefit people in their meditation practice and every day lives. Companies such as Centerpointe Research Institute are filling the growing demand for information, resources, and soundtracks that are effective tools for entrainment. To give you an idea of the different offerings available from each of these organizations. Holosync is a 13-level brainwave entrainment program offered by the Centerpointe Research Institute. This program was originally developed by Bill Harris, who practiced and studied Buddhism. The program solely uses binaural beats as its sound technology. It costs in the region of $3000 for the full program and offers lifetime support from the creators. However, be warned – this program is known to cause users intense emotional overwhelm and upheaval. So, the program may not be suitable for people with emotional problems or vulnerabilities. Having said that, Holosync is said to provide great benefits even with its “brute force” design. The Monroe Institute offers a variety of programs that incorporate a specially designed audio-guidance system called Hemi-Sync. Their online courses are quite expensive, and do not include the cost of CD’s, which range from $19-$25 each. Below is a sample of one of their online programs. The Gateway Experience Online Program: $1,595 — Audio-guidance to massage your mind in your own home, offered online through an experienced TMI trainer, who will take you through a waking state into deep relaxation, and then into unexplored dimensions of consciousness. This program takes you through six progressive levels called Waves, designed to take you through profound levels of awareness. Each Wave program can also be purchased separately for $295, which is a total of $1,770 for all six if purchased separately. CD’s must be purchased separately. The Monroe Institute also offers free one day mini-programs at their residential treatment facility in Virginia. They have Outreach Workshops as well, which are conducted by certified trainers in your area. These workshops take place over a one or two day period, and feature transformative techniques guided by Hemi-Sync audio-technology. For an extended stay at The Monroe Institute in Virginia, you can attend one of their 5 day/6 night residential programs, which includes training, tuition, lodging, and meals for $2,195. Mindvalley OmHarmonics was created by Vishen Lakhiani, a technology and personal growth entrepreneur who partnered with an audio engineer named Paul Hoffman to deliver improved meditation and life experiences through Binaural Beat audio technology. Now that you have learned about the benefits of brainwave entrainment, audio therapy, and meditation, you are well on your way to enjoying the experience for yourself. Today, transformation to a better life is more accessible than ever before, thanks to advancements in technology, and these new companies who are expanding the boundaries of human consciousness through sound.